Editor’s Note: The following article is reprinted from Network World. While the iPhone can’t heal lepers or turn water into wine, it can help you do a lot of other useful things, such as sharing high-resolution videos, diagnosing your own illnesses and even creating your own virtual life form! With Apple’s iPhone App Store now online, we decided to take a look at some of the more interesting third-party programs, applications and Web sites that have been developed to help make your iPhone an integral tool for both work and fun. For IT departments that want to have more control over how iPhones interact with their networks, Azaleos has extended its OneStop remote email monitoring services to the new 3G iPhone. Azaleos, a Seattle company that has traditionally provided e-mail management for BlackBerry and Windows Mobile devices, uses Microsoft ActiveSync technology to bring mobile devices under the control of its OneStop service, a subscription offering that provides 24-hour monitoring, maintenance and management. The OneStop service is part of Azaleos’ OneServer package that deploys a dedicated appliance within an IT network that provides an active/passive, fault tolerant and clustered Exchange platform for corporate messaging. Funambol, an open-source software development company that specializes in mobile application servers, is now providing a free open-source e-mail sync application for the iPhone. Starting this week, iPhone users will be able to sync their Personal Information Management (PIM) data for free through the company’s myFUNAMBOL portal to popular e-mail systems such as Gmail, Yahoo and AOL. Funambol’s wireless sync platform, which is supported through advertisements, is also available on Windows Mobile and Blackberry devices, and will soon be available on Google Android devices as well. The software for the application can be downloaded directly from the myFUNAMBOL Web site. For anyone tired of having their wallet or purse overstuffed with business cards, 211me’s paperless business cards could be just the ticket. 211me, which describes itself as a “mobile mash-up company,” lets users generate their own cards, flyers and promotions designed specifically for mobile phones. Thus, companies can create digital business cards for their employees or can design promotions that can be sent electronically to any mobile phone in the U.S. Any flyers and business cards can also be shared on social networking sites such as Facebook and Friendster, the company says. Users can design their own content by uploading their photos onto 211me’s Web site, where they can then choose from a wide variety of backgrounds and text styles. The concept behind RemindYou is remarkably simple—essentially, its goal is to make sure you never miss another appointment ever again. And how does it do this, you ask? Well, by syncing up with iCal, Outlook, or Entourage and then overlaying a graphic of all your appointments over the iPhone start-up picture. Thus, instead of seeing a picture of the Earth from space as your default start-up screen each time you unlock your iPhone, you’ll see a list of all your appointments. RemindYou can be purchased from the iPhone App Store for $19.95 for a lifetime license. While the iPhone has revolutionized the way we surf the Web on mobile devices, it can initially pose problems for new users who aren’t used to typing on such a compact space. Nuance is now working on bringing its voice recognition technology to the iPhone to drastically reduce the need for users to peck away at qwerty keyboards. It works like this: you launch the application from the iPhone startup menu, you click on a “speak” button once the application launches, you verbally tell the program what you want to search for, and then you click “stop.” The program will then translate your words into text and perform an Internet search for you. You can watch demonstrations of the software, which is still a prototype and won’t be ready for release until the fall, on Nunace’s Web site. By now, everyone knows that the iPhone 3G supports Microsoft Exchange ActiveSync and Cisco IPSec VPN to give enterprise customers at least some assurances of security for sending and receiving corporate e-mails. The folks at HyperOffice, however, want to give you more. By logging into your individual HyperOffice account through your iPhone’s Web browser, you’ll have access to applications such as document management with online storage and commenting, discussion groups, and shared documents, calendars, contacts, projects and tasks. Since HyperOffice is a service, users don’t need to download it from the App Store and can access it exclusively through the company’s Web site. The service is currently priced at $7 per month per user, and can also work on all smartphones and BlackBerry devices. Is there anything more fun than developing your own weird-looking creatures that evolve from single-celled organisms? OK, so it may not sound like everyone’s cup of tea, but that doesn’t mean that everyone can’t enjoy Spore, the oddly addictive strategy game from Electronic Arts that will be one of the flagship games to make its way to the iPhone platform. As demonstrated earlier this year, the iPhone version of Spore will give users touch-screen capabilities in designing their own customized creatures, from their genesis as single cells to their eventual evolution into intelligent, cooperative species. By utilizing the MPEG-4 h.264 video codec standard and letting users upload videos of any length, mDialog is working to become a high-resolution version of YouTube. In addition to offering standard features such as being able to vote, rate and comment on videos, mDialog also allows users to deliver fully-customizable surveys to get detailed reactions and advice from their audiences in real time. Tailored specifically for Apple TV and the iPhone as well as the general Internet, mDialog offers users up to 1GB of free video storage, with monthly membership plans of $4.99 for 8GB of storage, $9.99 for 20GB of storage and $24.99 for 50GB of storage. MDialog can be accessed through the Web and cannot be purchased through the App Store. Checking out baseball scores on your iPhone is one thing; checking out official game highlights is quite another. Jumping early on the iPhone 3G bandwagon, Major League Baseball has developed an application called MLB At Bat that will offer fans video highlights of games on their iPhones literally moments after they occur. Currently, MLB plans to offer MLB At Bat for an annual fee of $4.99. Pentaho, an open-source business intelligence applications developer, has developed an iPhone Web application that gives employees and management mobile access to crucial company data such as inventory reports, financial statements, income statements and sales reports sorted by customers, territories, and product lines. A demonstration of Pentaho’s open-source iPhone application, which specializes in delivering business intelligence data mining and analysis, can be seen on Pentaho’s Web site. Over the past two years, Twitter has taken the online world by storm as a happy medium between blogging and text-messaging. By letting users post updates of up to 140 characters onto their Twitter social networking pages, Twitter has emerged as a popular way for people to provide real-time updates about their work and lives to their friends and colleagues. 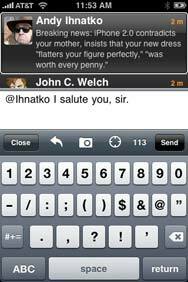 Twitterfic, an Interface developed by software company Iconfactory, is designed specifically to provide Twitter capabilities for Mac users and has been available for jail-broken iPhones since last year. For fans of old-school eight-bit graphics games comes Bomberman Touch from legendary Japanese game company Hudson Soft. Bomberman tells the gripping story of a disgruntled bomb-making robot who tries to escape his job at the factory by blowing a lot of stuff up. To win the game, you must guide Bomberman through several mazes while staring down fearsome enemies that look like giant frowny-faced balloons. Like Pac-Man and Donkey Kong, Bomberman is a timeless classic that should make a successful transition to the iPhone world. Worried about that cough that seemingly won’t go away? Concerned about that leg rash that’s costing you sleep at night? Fear not, because health information and benefits technology company A.D.A.M. has developed a Web application that lets users match their medical symptoms with assessments and potential treatments. Additionally, the navigator lets users know when they can help themselves through self care or whether they should consult a medical professional. The company says that its medical data and information is provided from its medically reviewed and URAC-accredited Health Encyclopedia. If 8GB of iPhone storage isn’t enough for you, give Syncplicity’s online storage service a try. Syncplicity lets you store up to 2GB worth of document, picture, music and video files for free and lets you access it instantly on your iPhone from within the cloud. All you have to do to access your stored data is log into Syncplicity’s Web site and then browse through your stored documents. Syncplicity currently offers 40GB of storage for $9.99 a month ($99.99 a year), and the company will add 100Mb to your account for every referral you provide. A fine tool for anyone looking to get in a round of golf on vacation or on a business trip, GolfFlyover can provide iPhone users with three-dimensional flyover maps of more than 10,000 golf courses in their entirety from across the United States. By the end of the year, the Web sitep rojects that it will have mapped every single golf course in the United States. All golf course information is provided free of charge, and no membership is required to view the maps. An oldie but goodie, AOL’s Instant Messenger is one of the classic Web applications for chatting and keeping in touch with your friends. Let’s say you want to bid online for a 1955 Gibson Les Paul Junior electric guitar, but you don’t have the time to sit in front of a computer screen all day. Simple! Just carry around your iPhone and use eBay’s native iPhone applications to get constant updates whenever that punk who calls himself Gtrfan62 has topped your bid. 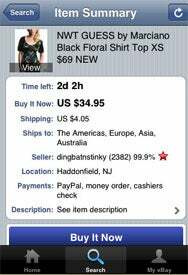 The eBay application is free and available at the App Store. Not wanting to get left behind in the online media world, the AP has created a Mobile News Network to provide readers with the latest headlines on politics, sports, business and entertainment. The AP iPhone app is free and available now. Although it sounds like an application developed specifically for stalkers, Loopt’s social network mapping tool is actually a location-based program designed to let you see where your friends are hanging out in your area. Essentially, whenever someone on your personalized buddy list is signed onto Loopt through their BlackBerry, iPhone or other compatible wireless device, Loopt will track them for you on a map that is custom-made for wireless devices. If you don’t want to be found at a particular moment, of course, you can sign out of Loopt or change your privacy settings. A quick-stop reference for all your drug-related questions, Epocrates’ drug database gives you information on drug uses, recommended dosages, pricing, interactions with other drugs and potential adverse reactions. This is another application that is currently available on the App Store. This story, "Twenty cool third-party iPhone apps" was originally published by Network World.